When I am in Portland, Oregon I love to visit the Saturday Market. Although it has considerably changed since I started really remembering going in 1990, it is still a quirky, weird, fun, and crafty market. I grew up in Portland, Oregon and was there until I graduated from high school. Saturday Market was definitely a staple during my youth. Me and Leah at the Saturday Market. Leah is my longest friend since 3rd grade. I went to Saturday Market this time around looking for my usual piece of art from the places I visit. I wanted something that really captured the Portland that I knew. The green, diverse, quirky, and artistic Portland. During this trip to the Saturday Market my friend Leah and I weaved our way through each stall looking for the perfect piece of Portlandlandia memorabilia. We found paintings, prints, pen and ink drawings, cat toys, purses, market bags, seasonings, and everything else you would expect from an outdoor market. I was running out of hope when--I kid you not--the second to the last stall--was Rhythmic Metal. I was immediately drawn to the completely unique images, metal work and size. I purchased two metal prints from Trent. He explained the process of his art and with a little bit of this and a little bit of that Trent transformed a piece of metal into an incredible piece of art. 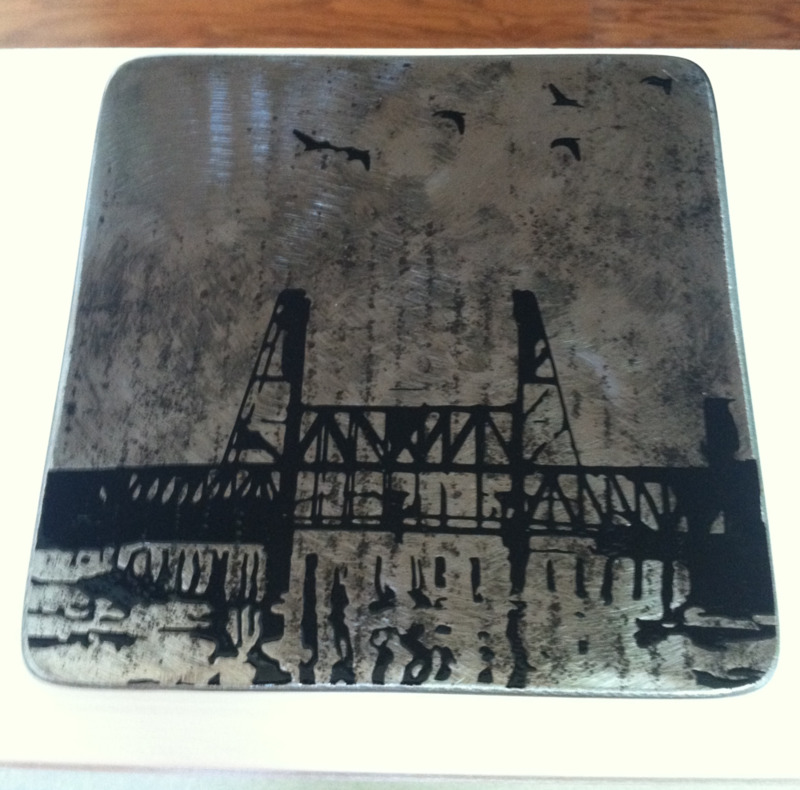 One of my prints is of the Steel Bridge in Portland and the other is the St. John's Bridge. Portland has the Willamette River going straight through the city, creating the need for several bridges and great muses for local artwork. Immediately the balance of the black images on the silver metal caught my eye. The stunning contrast that is what really makes the images pop. Although the actual art is only 6'' x 6'' the small size does not deter from the art making a focal point on any wall. The Artist: Trent, the creator of Rhythmic Metal has a website where you can order his artwork. He is a local artist in Portland and works with sustainable products. The Low-down: Trent and the family business offers all sorts of things metal, belt buckles, wall art, and jewelry are just a sampling of what they do. Trent clearly has an eye for contrast and a passion for metal work. His Etsy store is robust and he also does custom orders. Bottom Line: I love my new pieces of iconic Portland scenes. Rhythmic Metal is a family owned local business that deserves as much attention as possible because of the fabulously unique pieces. I look forward to hanging my new artwork on the wall where everyone can love them as much as I do.